Our Family visited the Brevard County Zoo just west of Cocoa Beach last year with our 2 kids, ages 7 and 10. We all really enjoyed it! This is NOT an "average" zoo! The over 500 animals are in natural habitat Vs in normal cages, and much of the zoo is outside where you walk on covered walkways, such as over the alligators in the swamp below, or among the trees viewing outside habitat cages. The signage is very well done, and our kids actually read many of the descriptive signs! The zoo is laid out very well, and divided into sections such as Africa, Australia, and Florida. It is well landscaped and kept VERY clean. We found the staff to be knowledgeable and courteous. Our kids loved the African section where they could feed the giraffes, and also the Australian section where the Kangaroos were fairly active hopping around the day we were there. We took one of the short Kayak rides, where you get very close to many of the animals, which the kids particularly enjoyed. We had a interesting guide who knew a lot of interesting facts about the animals and their normal habitat. We had read about the possible long waits at the Zoo Cafe, so ate breakfast late and then did a late lunch at the cafe after the noon rush was over and didn't have to wait too long, so would recommend that. 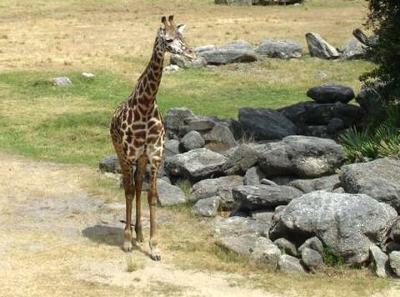 We would give the Brevard County Zoo a 5 stars out of 5 rating! We will go back again the next time we vacation in the Cocoa Beach Area! Join in and write your own page! It's easy to do. How? Simply click here to return to Florida Cocoa Beaches Favorite Attraction Raves and Reviews.